Clang! 'Miami Herald' Runs Ad Congratulating NBA's Heat : The Two-Way Only thing wrong: The Heat didn't win the championship. Instead, the underdog Dallas Mavericks bounced LeBron James, Dwyane Wade and company. 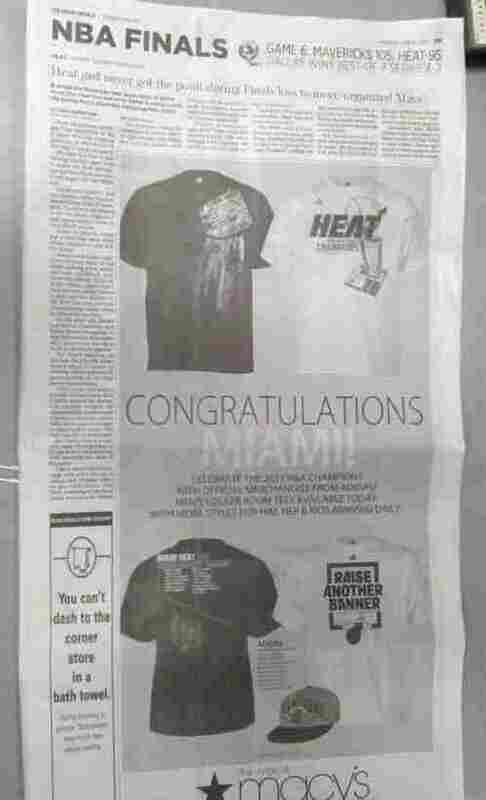 This morning, "Miami Herald readers opened their paper to find a nearly full-page ad reading 'Congratulations Miami!' next to photos of Heat championship T-shirts and hats from Macy's," writes Tim Elfrink at Miami New Times' Riptide 2.0 blog. Even worse, the ad was right under a story headlined "Heat Just Never Got The Point During Finals Loss To More-Organized Mavs." The problem: In case you haven't heard by now, the much-publicized Heat (with stars LeBron James, Dwyane Wade and Chris Bosh), did not win the NBA championship Sunday night. Instead, the league's new champions are the underdog Dallas Mavericks. Newspapers do prepare ads in advance. Of course, somebody's supposed to proofread the pages before the presses roll. And somebody also should have known that there was no way the ad could run today anyway, since the teams were playing game six and the best the Heat could have done was even the series at three games apiece. The Herald is sorry for its mistake. Our friend Linda Holmes at Monkey See just posted "A Short Photo Essay About LeBron James For People Who Don't Like LeBron James."